If you’ve graduated from an average school or college with poor grades or if you’re planning to ditch the current employer, the only thing that can get you a decent or high-paying job is a website that allows you to find and apply for jobs. To avoid this, use one of the job search apps we’ve shared below. LinkedIn was an independent company until Microsoft Corporation acquired it last year for 20+ Billion dollars. It is the best place to find new jobs. 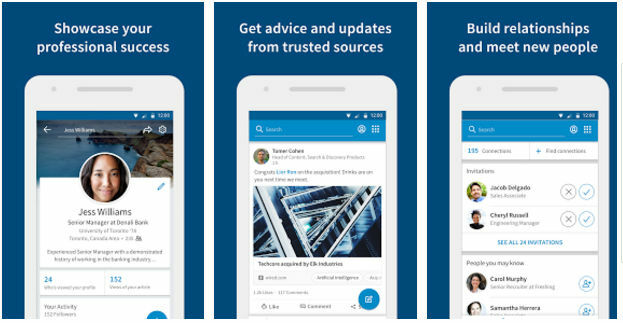 To get started with LinkedIn, you must create a free LinkedIn account. Once your account is ready, you can add your qualification, previous job experiences, certificate, award details to your profile. Job seekers must duly complete their LinkedIn profile to increase the chances of getting a job through LinkedIn. 1000s of multinational companies hire people through LinkedIn. They publish details of new job openings in the LinkedIn groups. To get updates from the companies, you can either follow them or join groups. LinkedIn is used by CEOs, CFOs, engineers, scientists, designers of top companies. It allows you to connect with other professionals. The statement big things come in small packages holds true for this app. 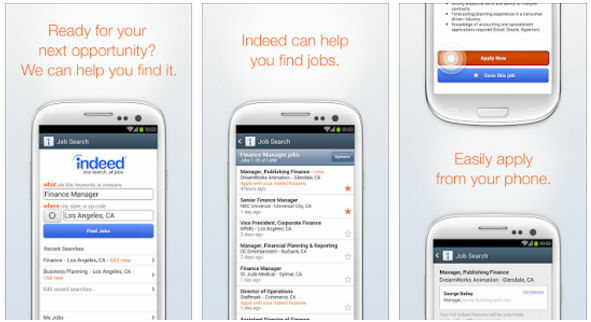 Indeed is a small app that gives you access to 1000s of employment opportunities. You can use this app with or without registration to find contract, full-time, fresher, or internship jobs. To search for job opportunities with LinkedIn, you must have a LinkedIn account. This is not the case with Indeed. To find jobs on Indeed, you must enter the job profile and the name of the city/state you’re willing to work in. Once you enter these two details, tap the blue color button. The Indeed application displays jobs matching the information you enter in the text fields in a nice interface. The interface displays the salary, job posting date, brief detail of the company and its rating. The app allows you to bookmark jobs. It provides a tool to filter jobs offered by firms that are within 50 kilometers range of your proximity. 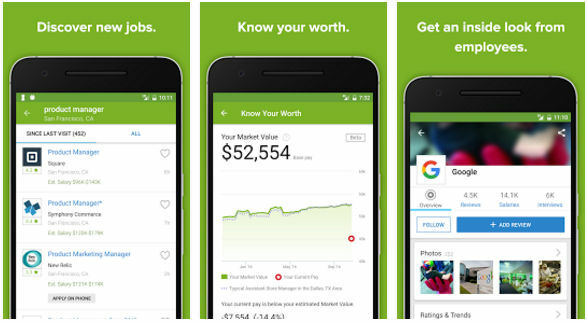 If you’re searching for a job that provides a better salary than your previous employer, download the free Glassdoor app. GD gives a useful insight into the company you’re looking forward to working with. It makes you aware of the nature of the existing employees and the salary structure of various job profiles. The information you find in the GD app is provided by the current or ex-employees of the companies. The Glassdoor app displays notifications when there’s a new job opening. It enables you to share job openings with other users. The application has a clean interface. It ships with a powerful search tool. Glassdoor enables users to follow top companies. It lets users upload resumes so that they can apply for the jobs quickly. Trovit is a popular job search app. It has 5 million downloads and superb rating on the App Stores. Trovit detects your location and displays jobs that are available in your region. To find job openings in other countries, navigate to the app’s settings interface. Then, change the country. Finding and applying for an open position is easy with Trovit. To find a job, open the app’s main window and fill the two text fields. Then, tap the search button. Trovit displays openings from large multinational companies as well as startups. It lets users bookmark jobs. Trovit has an option to share current openings with friends. 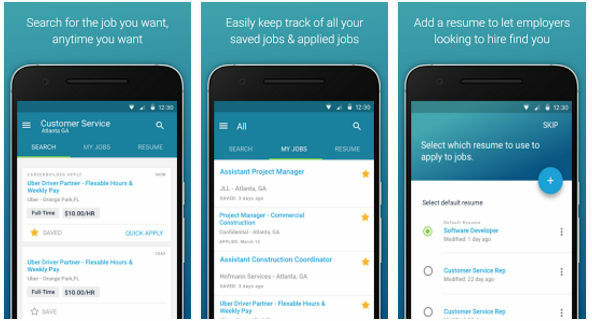 The app displays the recently searched jobs on its main interface. It allows you to create personalized alerts. 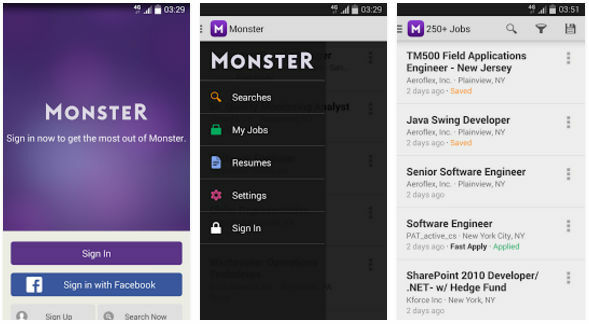 Monster.com is one of the largest job search portals in Asia. For some reasons, its application has average ratings. Like LinkedIn, Monster lets you connect with other job seekers. It enables you to follow companies and get real-time updates from them. 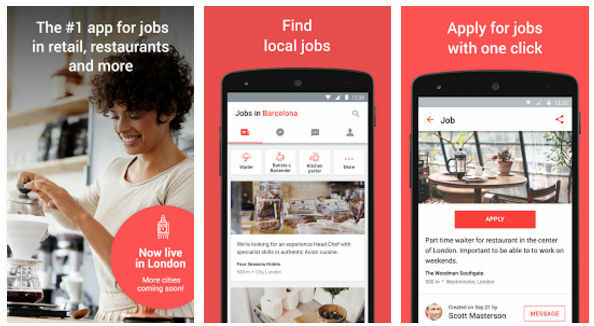 The app lets users find jobs from their mobile devices. It can import their resumes from cloud storage platforms. If you’ve created an account with Monster.com website, you can manage your account with this application. Monster is compatible with Android 4.0+ and IOS OS running devices. JT is one of the top job search apps on the Play Store. It is a great app for finding employment opportunities in local business such as shops, eateries, malls, etc. According to its developer, if you apply for a job with JT, you’ll hear from the employer within 24 hours. JT allows a job seeker to chat with the recruiter. You’ll have to register an account to use it. 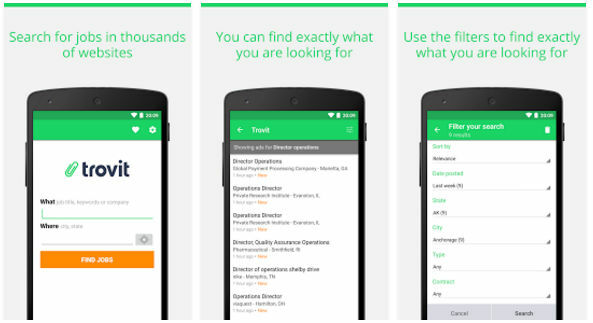 CB is a free app that maintains a list of jobs you’ve applied to. It lets you upload resumes from the phone’s storage memory. You can also import your resume from Dropbox, Google Drive, etc. Career Builder allows users to save jobs. It provides an option to find jobs by name, location or a specific keyword. CB analyzes users profile/search history and suggests jobs to them. The recommendations are based on the keywords the user has used to search for jobs. Conclusion: The above job search apps have excellent features and genuine listings. If you use the apps daily, your chances of getting recruited by a top firm will be great.